The cottage Alice welcomes you for a pure moment of exception and well-being. Located between Strasbourg and Colmar in the beautiful valley of Villé, this duplex apartment of 80 m2, in an old farmhouse, renovated in a contemporary design style will seduce you. It can accommodate from 2 to 4 people. It is ideal to meet with family, friends or lovers. From November, until the end of December, tradition requires, Christmas markets settle in Alsace (Colmar, Strasbourg, Kayserberg, Ribeauvillé, Riquewihr). For an unmissable step, enjoy your visit for a moment of magic with magical and glittering decorations. Gastronomy and crafts invites you, between scents of gingerbread and scents of mulled wine, to garnish your baskets of local products and gifts. You will have an ultra equipped kitchen open on a spacious living room, a bathroom and two bedrooms with bedding of very good qualities. In its outbuilding, you will find our balneotherapy area of ​​35 m2 with a Jacuzzi spa for 6 people including an elongated place and its lights by chromotherapy, a bathroom and a relaxation area. You will be charmed by its interior decoration. The Jacuzzi is equipped with a filtration system and an osmosis unit for disinfecting the water. The spa water is regularly changed, tested daily and treated to help keep the water clean and clear. 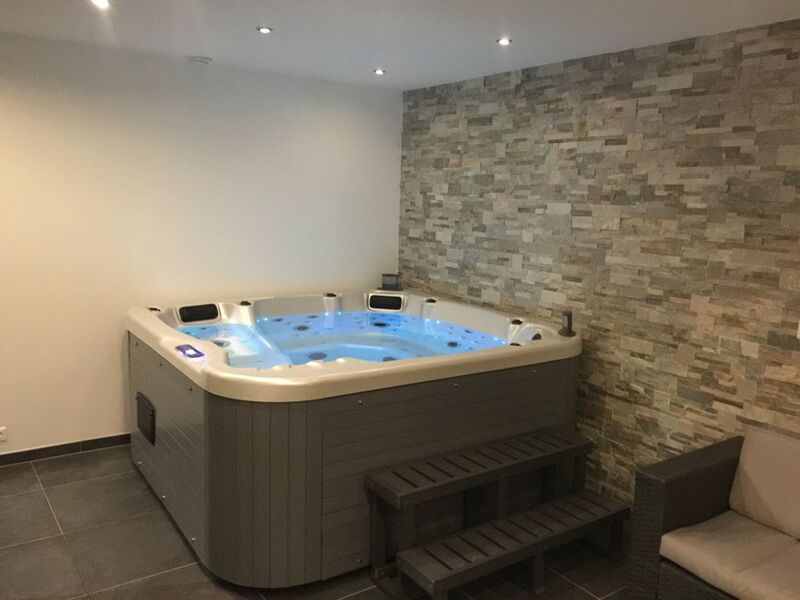 The Jacuzzi is ready to use on your arrival and you will have exclusive use for the duration of your stay. A real moment of relaxation from head to toe! Outside, in a green setting, you can enjoy the heated outdoor pool, with swimming against the current, open from May to September. To the delight of young and old, a trampoline is available. In this relaxing place, linen (sheets, towels, tea towels), free wifi, flat screen TV and private parking are at your disposal. All your requests for options such as relaxing massages, crémant, flowers can be requested by reservation. Swimming pool 4x8m heated by 30m2 solar panels and equipped with a swim against the current. Lovely well equipped holiday home and wonderful hosts! Everything was perfect from start finish! Soon after we received confirmation for our booking, we were contacted by our hosts and they gave us additional information about the holiday home and asked if we needed any information. Nicolas organized for a masseuse to come to the property and ask sent us the link for a pony riding place and playground nearby. We were supposed to arrive between 6-7pm but unfortunately were delayed and only arrived at 10.30pm and were very warmly welcomed and even offered pasta and tomato sauce in case we didn't have food available. On arrival, we were very pleasantly surprised to find that everything was beautiful, very clean and the home was equipped with all possible equipment that could be needed when on vacation. We had such a lovely stay and we all enjoyed both the heated pool and the whirlpool. For anyone looking to travel to the Alsace region, we most definitely recommend this holiday home. Merci à Pamela et à sa sympathique famille pour votre séjour dans notre gîte. Très bon contact, respectueux et soigneux des lieux. Thanks to Pamela and her friendly family for your stay in our cottage. Very good contact, respectful and careful. Excellent accueil dans ce gîte fonctionnel et très propre, dans un environnement agréable. Nous avons passé un excellent séjour.